Before taking the driving test you have to get a learner's license.For that you had to to take an objective test on the computer in the RT office. The questions that are asked correspond to important trafic signs, traffic rules etc. Books are available that contain model questions (usually in malayalam). But I was able to find an online version of the model questions in english. 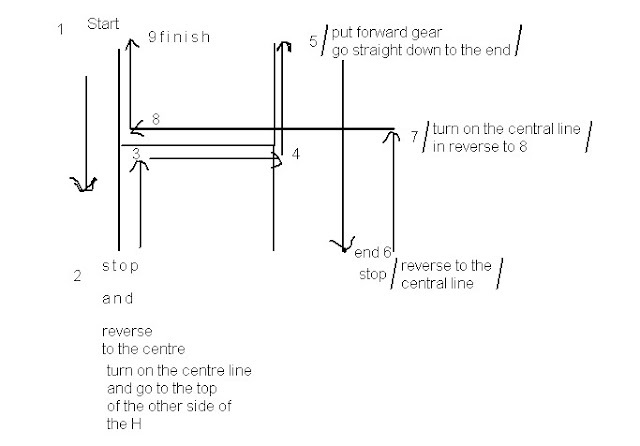 After passing the test you are given a date after several weeks to appear for the driving test which consisted of taking a H test (driving the car in a particular pattern between iron stakes arranged in the shape of an H ; you go forward along one of the vertical lines of the H from bottom to top , then reverse to the middle , go in reverse along the centre horizontal line of the H , and then to the opposite bottom of the other vertical line of the H in reverse , then forward to the top of that vertical line , then reverse to the middle of the vertical line, then in reverse along the central horizontal line of the H and then in reverse along the first vertical line to the starting point. )and a short driving test on the road to test the gear shifting and hand signals. My father taught me driving in his old petrol ambassador car (amby). But before going for the driving test, father advised me to take the test in a maruti 800 which is smaller and hence might make it easier to take the H test. So we went to a driving school. The maruti 800 had the gear lever on the floor as opposed to the gear lever on the steering column of the ambassador I practiced on. So we paid the driving school for a couple of hours of driving practice on the road and for practice of the H test using the Maruti 800. The teachers at the driving school were very helpful. For those who had trouble taking the H test smoothly, they gave some pointers like stopping and taking the 90 degree turns based on sighting the iron stakes at certain points relative to the car's rear window quarter glass etc. They also raise/adjust the fuel flow to the engine during idling for the test so that the engine does not shut down frequently in the hands of the amateur drivers. 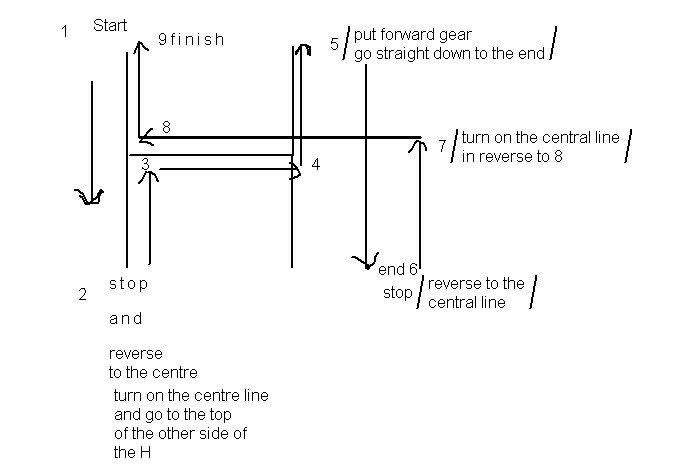 please tell me how to pass H. Tell me how to move on (reverse) without the car turning off during H.
Ok.. can someone explaing How to take the 'H'Correctly with the Steps and Hints. thank you very much for your explanation. now i got an idea to take H.